I hadn’t tried NoScript before. Wearing my security-minded developer’s hat, I like the idea. It’s a great way to see which scripts are invoked by various websites, and to understand how those sites behave with those scripts enabled or disabled. You might think that you would have to spend a lot of time managing the policy, but surprisingly, you don’t. On the one hand I’m inclined to agree. We’ve seen the same thing with firewalls that do outbound filtering. But on the other hand, NoScript prompts occur much more frequently. Will civilians be willing to deal with that? I’d be curious to know how non-geeks are getting along with NoScript. Author Jon UdellPosted on 7 Nov 2007 7 Nov 2007 Categories . Even from a geek’s perspective, I found it to be too much after about a few weeks of clicking prompts. Eventually it just became a whatever button. I have also used NoScript since its early days, but for me the best recommendation came from reading Planet Web Security. (You *are* reading Planet Web Security, aren’t you? http://planet-websecurity.org/ .) The hackers on PWS are the kind of people who find the bugs that result in new point releases of Firefox (and other browsers). They recommend NoScript, and in fact the NoScript author works with some of them to ensure that you are as protected as possible, even in the face of browser bugs. Running NoScript can sometimes protect you from security holes in the browser itself. It’s much more than just site-specific whitelisting. However, having just installed it, I find it to be a Java/Silverlight blocker and a Flash allower…Just curious: Why? 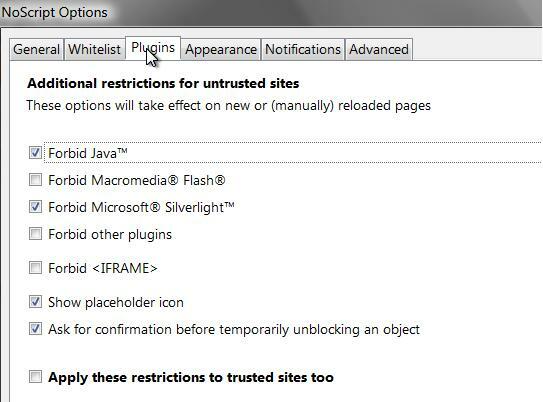 Would you say that strategy is equivalent to whitelisting those 30 sites in IE by placing them in the trusted zone? Intrusive behaviors ranging from the merely annoying to the downright malicious. engtech / Shital Shah: the most important thing you are protecting yourself against is security bugs in the web applications that you use. A huge number of applications have either XSS or CSRF holes in them (definitions on Wikipedia) and such sites are open to a wide range of malicious attacks. Using NoScript means that even if a site you use has a security hole attackers will find it much harder to use it to exploit your acconut. Certainly not. For one thing, anything in an IE Trusted Zone has very liberal access to what can be installed on your machine. Especially neferious ActiveX controls. Additionally, it’s very easy to use NoScript to temporarily permit a site, but the next time you start your browser, it’s banned again. This is good for single-use instances but you don’t want to give carte blanch access for the site. On the other hand, adding a site to the Trusted Zone requires explicit revocation of those permissions, even if you only wanted to hit a one-off page. Also, to also address the issue of “with so much AJAX out there, how can you survive without JS?”, it’s not all that hard. Good web developers plan for graceful degredation. The bad ones tend to make sites that are dysfunctional without it. Bad sites aren’t usually worth visiting. The small intersection wherein lie “good sites that are break without JS” are the handful that are in my whitelist. These include annoying bits of work-related sites, banking, Gmail, etc. where I’ve evaluated the risk and decided that it’s worth giving this site permission to run arbitrary JS code on my machine. I’m a complete idiot and I’ve been using noscript for years. All I know is that it blocks crap I don’t need to see. When I want to see crap I just switch the thingy. Done and done.